All Web addresses mentioned were functional as of 8-20-15. From the Cumberland Gap to the Atlantic Ocean, this is Virginia Water Radio for the week of August 24, 2015. This week, music from “The Oystermen’s Ball,” by Bob Michel of Pennsylvania, opens a two-episode exploration of the historical and current importance of the Eastern Oyster. Have a listen for about 40 seconds. “The Oystermen’s Ball” was inspired by the history of oystering in the Delaware Bay. In that bay, in the Chesapeake Bay, and in other Atlantic and Gulf coast estuaries, the Eastern Oyster is a key bottom-dwelling organism, feeding on suspended algae and building reefs that support diverse ecological communities. For centuries in human coastal communities, oysters have been a source of food, income, materials, and cultural identity. Harvests from the Chesapeake region’s oyster beds sustained native peoples and then supported a large commercial industry during the 19th and 20th centuries, until overharvest, disease, pollution, and habitat loss drastically reduced the oyster population, taking much of the oyster industry along with it. Today, many efforts are underway to try to restore the Chesapeake’s oysters, including disease research, harvest regulation, watershed pollutant management, shell replenishment, and various kinds of aquaculture. Why have oysters been so valuable for so long, even to the point of “Oyster Wars,” the term for nearly a century of conflict in the 1800s and 1900s over Chesapeake Bay oysters? Taste and versatility as a food are obvious reasons, but another is oysters’ high nutritional value as a protein. Proteins have many structures and perform countless functions, but one thing they all have in common is nitrogen in their basic architecture. Through filter-feeding on algae, which take up dissolved nitrogen, oysters concentrate the nitrogen into protein usable by humans. That nitrogen connection is one big reason why oysters are part of plans for restoring the Chesapeake’s overall aquatic health; and it’s the focus of our next episode. "The Oystermen’s Ball," from the 2004 album of the same name, is copyright by Bob Michel, used with permission. More information on Mr. Michel's music is available online at http://www.bobmichel.com/. Oysters boats at Chincoteague, Va., April 1946. Photo made available for public use by the NOAA Photo Library (National Oceanic and Atmospheric Administration/U.S. Department of Commerce), image ID fizh0394 in NOAA’s Historic Fisheries Collection, accessed online at http://www.photolib.noaa.gov/index.html. 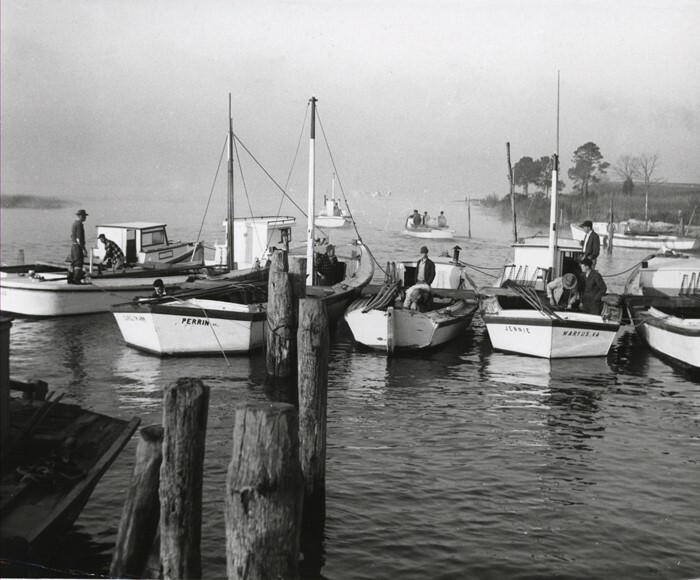 Oyster-tonging boats near Gloucester, Va., circa 1961. Photo made available for public use by the NOAA Photo Library (National Oceanic and Atmospheric Administration/U.S. Department of Commerce), image ID fizh0395 in NOAA’s Historic Fisheries Collection, accessed online at http://www.photolib.noaa.gov/index.html. 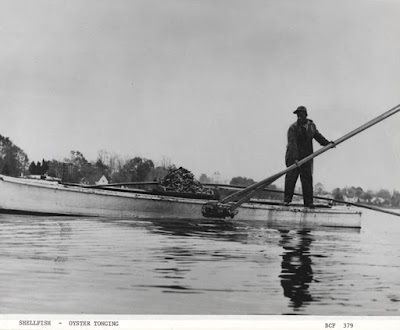 Oyster tonging at Oxford, Md., November 1961. Photo by Robert K. Brigham, made available for public use by the NOAA Photo Library (National Oceanic and Atmospheric Administration/U.S. 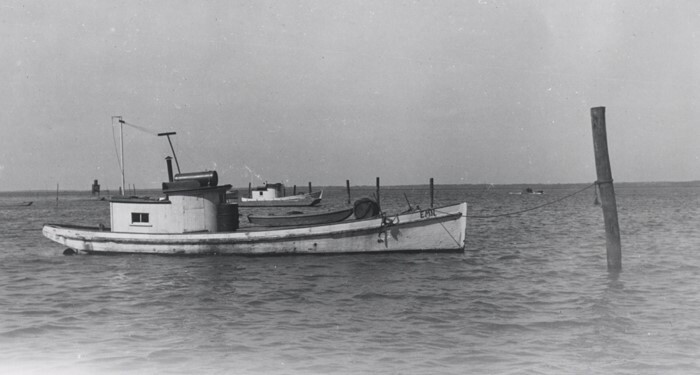 Department of Commerce), image ID fizh0398 in NOAA’s Historic Fisheries Collection, accessed online at http://www.photolib.noaa.gov/index.html. 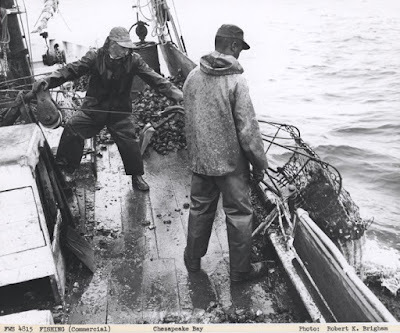 Oyster dredging in the Chesapeake Bay, February 3, 1964. Photo by Robert K. Brigham, made available for public use by the NOAA Photo Library (National Oceanic and Atmospheric Administration/U.S. Department of Commerce), image ID fizh0342 in NOAA’s Historic Fisheries Collection, accessed online at http://www.photolib.noaa.gov/index.html. Associated Press, 2 Million Project Restoring Oyster Reef in Virginia River, as published by WBOC-TV (Delmarva Peninsula), 7/19/15. Maryland Sea Grant, “Oysters,” online at http://www.mdsg.umd.edu/topics/oysters/oysters; and “Oyster Aquaculture and Restoration,” online at http://www.mdsg.umd.edu/topics/oysters/oyster-aquaculture-and-restoration. NOAA/National Estuarine Research Reserve System, “Estuary Education,” online at http://estuaries.noaa.gov/Default.aspx. 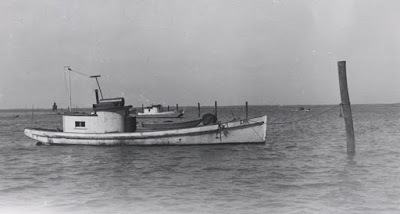 Virginia Institute of Marine Science (VIMS), “Oysters @ VIMS,” online at http://www.vims.edu/research/topics/oysters/. Virginia Marine Resources Commission/Conservation and Replenishment Department, online at http://mrc.virginia.gov/replenishment.shtm; see particularly “Virginia’s Oyster Management and Industry Today,” 2001, online (as PDF) at http://mrc.virginia.gov/VIRGINIAS_OYSTER_MANAGEMENT_AND%20_INDUSTRY_TODAY.pdf. Andrew David Thayer, Mud, Shuck, and Spat, by in Hakai Magazine (Victoria, British Columbia, Canada), 3/15/16. ES.10 – ocean processes, interactions, and policies affecting coastal zones, including the Chesapeake Bay.